2013 seems to be a great year for China's online video game market with the release of some pretty cool online games. Deviating more and more from the standard click and grind RPG format, Chinese game companies have been pumping out interesting and visually appealing games, foreign and domestically-developed alike. 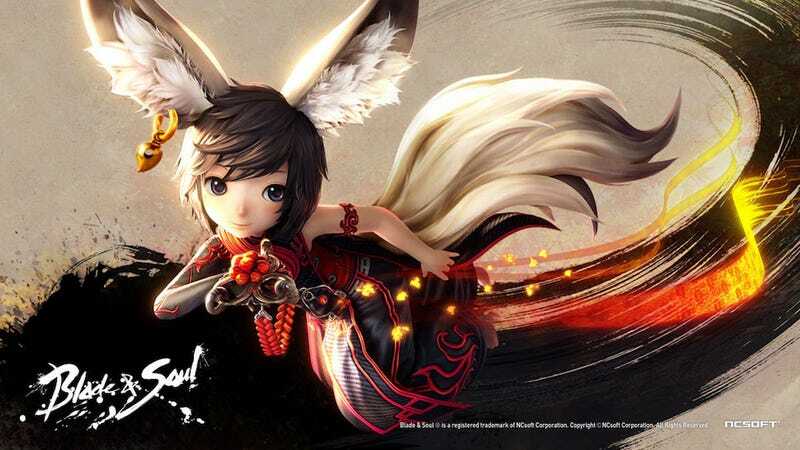 One such example is Blade & Soul, which, like many of China's already established MMOs, takes its art style from the Chinese martial arts fantasy genre known as Wuxia. Using its Wuxia background and adding more fantasy elements, Blade & Soul creates a world where demons and men live together and everyone who wields a sword has some kind of energy power. Aesthetically, the game is very pleasing. Unlike most Chinese-released online games that are designed to run on pretty much every computer, the first time you load Blade & Soul, the installer asks what setting the game should be played on. Graphically, the game isn't exactly breathtaking, but it is miles ahead of most other Chinese MMOs. I would say that it's on par with Tencent's other new MMO, Asura Online. Like Asura Online, Blade & Soul is chock full o' in game movies that take up quite a bunch of time. These visuals are cool too look at and help immerse the player into the story of the world. The only thing bad about the experience is the terribly kitschy voice acting. But before the story can start, there is the character creation. Blade & Soul has one of the most comprehensive and complex character creators I've had the luxury to play with in China. Think the level of detail you have when you create a Mii on a Nintendo device and then multiply that 100-fold and add loads of sliders that affect the most minute of details. I spent a good hour trying to make my character sort of resemble our resident Snackologist, Mr. Mike Fahey. The obvious difference is that my avatar isn't a 6 foot 4 tall devourer of deliciousness. The story is pretty simple: it deals with demon swords with massive powers, and evil forces trying to get their hands on it. Early on in the game, the story provides the player character with a backstory: They start off as a member of a martial arts school which holds the terrible Ghost Soul Blade (translation). Halfway through training, a squad of evildoers come to take the sword. Fighting ensues, people die, and the player is plunged into a new land where he/she must fight and train and eventually hunt down the people who destroyed his/her home. This story is actually a lot more interesting than I just made it sound like. Moving past the story, the game plays like World of WarCraft, with WASD moving the character and the mouse moving the camera. For some reason, it made me kind of nauseous, even though the controls had a good flow to them. My 17 year-old neighbour at the net cafe also complained of motion sickness. She had been playing the game since it launched, but she stopped playing after about three hours in. But camera issues aside, the game is like every MMO, except there is a focus on chained attacks. Left click, left click, then right click will unleash a combo. Left click, tab, right click, another combo. Basically, the game wants you to have fun with its battle system instead of just constantly clicking on stuff. The only downside to this is the camera system where the player must face an enemy to attack. The camera controls make it possible to attack and create a combo that doesn't actually touch anything. Interestingly, one of my favourite additions to Chinese MMOs, one click travel, isn't in the game. Instead of being able to auto travel to a location, the game focuses more on exploration. You have to run from point A to point B—but it's okay, since the game is rather pretty. All in all, I'm rather psyched for the prospects of Blade & Soul. Though technically in Beta, the game is considered released in China, and the number of available servers to play on is growing. Best known for games Linage, Guild Wars and Aion, South Korea's NCSoft's Blade & Soul is a great addition to Tencent's ever growing stable of amazing games. I have a feeling that Blade & Soul will continue to thrive even with the eventual release of games such as Monster Hunter Online (also Tencent) in China. I'm looking forward to playing more Blade & Soul and I've already made a play date next weekend to play with the young woman who was sitting besides me at the net cafe. Hopefully this time she won't get sick, her character is a tank.